Images of asteroid (2867) Steins taken by the OSIRIS Wide Angle Camera on Rosetta during the fly-by of 5 September 2008. The effective diameter of the asteroid is 5 km, approximately as predicted. 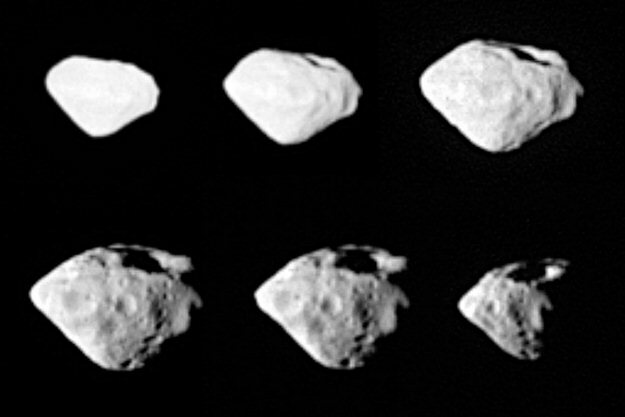 At the top of the asteroid (as shown in these images), a large crater, approximately 2 km in size, can be seen. (*) The estimates are based on the predicted time of closest approach (20:38:16 CEST - spacecraft event time). Some changes to these distance and phase angle estimates may be introduced when the actual time of closest approach has been confirmed. These are expected to be no more than 50 km for the larger distances and no more than 10 km at closest approach. The phase angles are expected to change by no more than 2 degrees.